What Are The Best Online Master's in Behavioral Psychology Programs? According to PayScale, professionals in applied behavior analysis who hold a master's degree earn about 10% more than those with an undergraduate degree. Pursuing a master's in behavioral psychology online is the first step toward earning a higher salary in the field. This guide covers the most important factors to consider when choosing an online degree program. UIC offers an online master's in educational assessment program that prepares graduates to work in educational research settings. This program was created to address the industry-wide shortage of individuals capable of performing effective educational research. Courses in this program are offered synchronously online and students must enroll in exactly one course per semester for eight semesters. Some students decide to enroll in two courses per semester to graduate in four semesters. The 32-credit curriculum includes courses on a variety of topics, such as mathematical modeling, educational measurement, and hierarchical linear modeling. Applicants to this online M.Ed in assessment can apply for admission in the fall, spring, or summer and must submit GRE scores to be considered. Transfer students can apply up to eight credits of prior graduate coursework towards their degree. UIC is accredited by the Higher Learning Commission. Mary is a private Catholic university located in Bismarck, North Dakota that serves more than 3,000 undergraduates each year. The school offers a variety of distance learning programs, including a 20-credit online master's in educational assessment. The program is open to both licensed, working teachers and unlicensed, future teachers who want to earn a North Dakota teaching license along with their degree. The curriculum includes courses on a variety of topics, such as statistics, differentiated instruction, and integrating technology in the classroom. Students must also choose between writing a thesis or building a portfolio as a culminating capstone project. Applicants must have a bachelor's degree with a minimum GPA of 2.5, a minimum GPA of 2.75 during their final two years of undergraduate study, or a minimum major GPA of 3.0 to be considered. A teaching credential is preferred but not required. Mary is accredited by the Higher Learning Commission. Kent State offers an online M.Ed in assessment that is ideal for students who want to pursue careers as K-12 teachers, curriculum and evaluation professionals for school districts, and private sector research experts. This 32-credit online master's in educational assessment can be completed in two years of full-time study or four years of part-time study. Courses are delivered asynchronously online, allowing students to complete coursework at their own pace. The curriculum includes 12 credits of core coursework on topics like statistics, program evaluation, and classroom assessment. The remaining 20 credits are electives on a wide variety of topics, such as factor analysis and curriculum evaluation. Applicants must have a bachelor's degree with a minimum GPA of 3.0 to be considered; there is no GRE requirement. Kent State is accredited by the Higher Learning Commission. Missouri Western offers an online M.Ed in assessment degree that prepares graduates to work with high-needs students, including those with autism spectrum disorders or who are enrolled in TESOL programs. This master's of applied science in assessment emphasizes hands-on coursework and small class sizes, which allows students to receive one-on-one attention from faculty. Courses are delivered asynchronously online, allowing students to complete coursework at their own pace. Missouri Western offers tuition discounts to groups who enroll in the program as a cohort. Students may apply to enter the program in the fall, spring, or summer terms. Applicants must have a bachelor's degree in education or a similar field with a minimum GPA of 2.75 to be considered; there is no GRE requirement. Missouri Western is accredited by the Higher Learning Commission. UA offers a M.Ed in assessment, evaluation, and data literacy that is ideal for current and future teachers who want to become assessment and evaluation leaders in their schools, school districts, or state. This 30-credit program teaches students the important skill of using data to make smart decisions on education-related topics. The curriculum includes coursework on topics like educational psychology, data-driven decision making, and educational evaluation. Students must also complete a culminating capstone project in assessment and evaluation. UA's online M.Ed program is currently only available in 36 states. Therefore, prospective students should check the school's state authorization page before applying. Students can apply to the program for admission in the fall, spring, or summer terms. Applicants only need to submit a graduate application and official transcripts to be considered; there is no GRE requirement. UA is accredited by the Higher Learning Commission. According to the Bureau of Labor Statistics, unemployment for those with a master's degree is lower than unemployment for those with an undergraduate degree. Earning a master's degree creates higher earning potential and more job opportunities. The Council of Graduate Schools releases a yearly report on applications and enrollment to graduate programs. The table below outlines some of these findings from fall 2016, in relation to master's degree programs and enrollment data. Online master's in behavioral psychology programs have varying requirements and offer different courses. Below are a few courses common to most master's in behavior psychology online programs. Although curricula vary by program, below are sample courses often offered in most master's in behavioral psychology online programs. Behavior Change Systems: Behavioral psychologists create and implement interventions and programs to assist clients and patients in changing unhealthy and destructive behaviors. This course teaches students to create these plans and provides fundamental background knowledge. Behavior Assessment: This course prepares students to assess the behavior of new patients and clients and to use this initial assessment to create appropriate intervention plans. Research Methods: This course provides the fundamental research skills that graduate students in all areas need to produce quality research and to contribute to the field. How Long Does it Take to get an Online Master's in Behavioral Psychology? Generally, online master's in behavioral psychology programs require about two years to complete. However, this timeframe varies widely. Many online programs are individually paced and allow students to complete coursework according to their own timeline. Other programs operate in cohorts; groups of students progress through the program together, at the same pace. Credit requirements vary by program, and some programs require internships and/or supervised practicum hours. Whether the student is enrolled part-time or full-time also significantly impacts completion time; part-time students typically take longer to complete coursework. Board Certified Behavior Analyst: Most online master's in behavioral psychology programs prepare students to sit for the Board Certified Behavior Analyst exam. This official certification allows professionals with graduate degrees to practice. A set number of internship and practicum hours are required to sit for the exam. State Licensing: While many states require only certification, some states have their own licensing procedures. Students should research their state's requirements prior to graduating and entering the job market. Accreditation is the process by which schools and programs are held to academic standards. Accreditation is very important to choosing a reputable school. Unaccredited programs are often non-reciprocal, meaning degrees and credits may not be recognized by other institutions or employers. A school may be accredited regionally or nationally, but regional accreditation is more popular. Regional accrediting agencies are widely recognized, and degrees and credits from regionally accredited schools are more easily transferred to other institutions. Some programs also have field-specific accreditation. 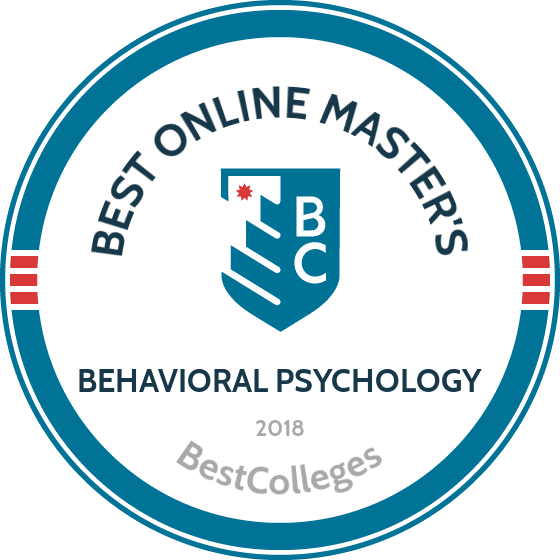 Master's in behavioral psychology online programs are often accredited by the Association for Behavior Analysis International, which provides a list of accredited programs on its website. The Department of Education and the Council for Higher Education Accreditation offer comprehensive databases of all regionally and nationally accredited institutions. Choose an accredited school to ensure eligibility for federal aid. Salaries vary by employer, position, and geographic location. According to PayScale, the average salary of a board certified behavior analyst is $57,511 per year. The table below details the five U.S. cities in which behavior analysts earn the highest salary. Each online master's in behavioral psychology program prepares students for different careers. Programs may be housed within master's of arts, science, or education degree tracks. Each type of degree fosters different skills, preparing students for specific roles. These counselors often work in drug and alcohol rehabilitation centers, with patients recovering from substance abuse. They may also work in mental health facilities. Social workers work within communities to help struggling clients build stable lifestyles and create healthy environments for families and children. Clinical social workers may also diagnose and treat mental illnesses and substance abuse issues. Mental health counselors work in a variety of settings, including private practices, university health centers, hospitals, and mental health treatment facilities. They counsel patients and provide support. Rehabilitation counselors work with clients who have a physical, mental, or emotional disability. These counselors may work in assisted living facilities, rehab centers, physical therapy practices, or youth centers. Sociologists study the behaviors and cultures of people within certain groups, including organizations, workplaces, and neighborhoods. These researchers often work at universities or colleges, but some work in government. Financing a graduate degree can be difficult, but there are plenty of options. First, complete the Free Application for Federal Student Aid (FAFSA) to determine how much federal funding you are eligible for. Many graduate programs offer fellowships and graduate assistantships; check your program's guidelines for applying for these funds. Some employers may offer tuition assistance to employees earning a higher degree or certification.